Precisely Plan, Post & Predict: Pinterest is Now in Sprout! Across all of the platforms you use to engage with your community, one has been strategically designed to drive conversions for your brand. At its core, Pinterest inspires. But in practice, Pinterest can hold the key to social ROI. With 87% of Pinterest users having purchased a product due to Pinterest, the platform opens up a unique (and valuable) opportunity for brands — and for Sprout. As an official Pinterest Marketing Partner, we are excited to announce our newest integration — and satisfy our #1 customer requested feature: Pinterest in Sprout. 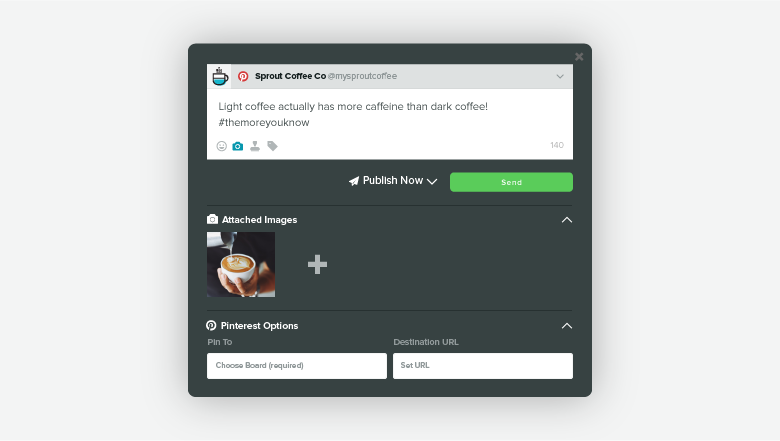 Available to all plans, Sprout’s Pinterest integration unlocks publishing and reporting capabilities so your team can create, publish and measure Pinterest content directly within Sprout Social. Reaching new people can be an ongoing and collaborative process — planning timelines, creating compelling content and predicting future audience behaviors. The right set of tools can ensure your Pinterest strategy is set up for success. Sprout’s built-in Message Approval workflow facilitates convenient collaboration when scheduling and creating new Pins while also increasing efficiency during the review and approval process. Pinterest provides a visual-first approach so utilize Message Preview to view future Pins and to ensure alignment with your brand’s overall Pinterest strategy. If your brand is planning a creative campaign featuring dedicated boards and Pins, repurpose evergreen content by leveraging the Asset Library, a central location for brand-approved content, repeated descriptions and approved images. For most, a strong digital strategy can span across several networks and platforms, multiple profiles and include an assortment of assets that can be time-consuming for teams to manage. With Sprout as your central platform, you and your team will save time by planning and publishing content for Pinterest alongside your broader strategy. 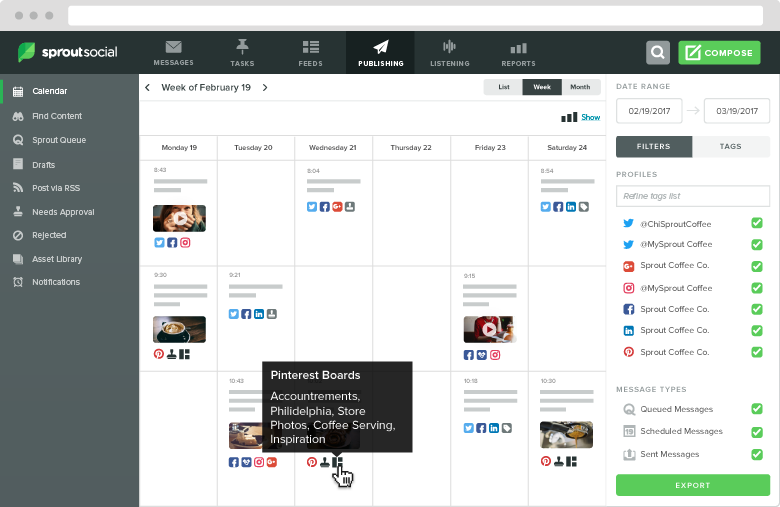 The Publishing Calendar provides an all-inclusive look into social posts across multiple profiles, networks and campaign tags. If featuring customer stories or influencer marketing is a part of your strategy, quickly save Pins and post them to a themed board with Sprout’s Chrome browser extension to highlight real people promoting your brand. Did you know that more than 5% of all referral traffic to websites comes from Pinterest? And if you play your cards right and invest in the proper tools, that number is consistently growing. 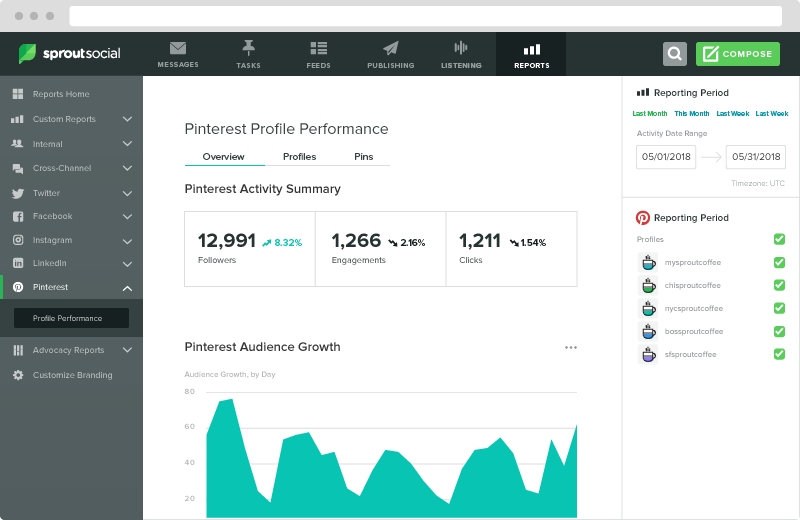 To measure your Pin performance and start to gauge the impact your content has on conversions, Sprout’s Pinterest Reporting offers analytics and tracking built-in to your publishing strategy. Easily record traffic from Pinterest to your specified domain with a standardized workflow for URL tracking within Sprout. Then, to understand your overall performance, access Sprout’s dedicated Pinterest report to gain key metrics on profile-level analytics and uncover your brand’s top performing Pins to help guide future strategies. Whether your brand is focused on e-commerce, increasing visual discoverability or driving more leads to your website, Pinterest cultivates a space for millions of people open to uncovering new ideas, brands and products. Optimize your Pinterest strategy with a new comprehensive workflow and key insights to help keep you aligned to your goals. Stay tuned for more updates! As always, let us know your feedback in the comments below or hit us up @SproutSocial on Twitter.